The workshop that keeps some of Libya's most powerful militias running does not immediately impress. Housed in a dusty warehouse at the end of a bumpy road on the outskirts of Misrata, its doors are half-heartedly guarded by men in mismatched military clothing clutching Kalashnikovs and cigarettes. But inside, a cacophony of grinding, welding, and hammering continues late into the night as a team of volunteers works to overhaul decades-old guns, launchers, and ammunition. The makeshift factory has been operational since 2011 when it helped arm the revolutionary groups that ousted and killed dictator Muammar Qaddafi. Now, it continues to service the factions those groups have become. There's no shortage of weapons in Libya, since rebels looted vast government caches during the uprising. But none are new, many have been poorly maintained, and work is often required to make them fit for battle — sometimes modifying them in ways that were never intended. Much of it is done in this workshop, which local forces say has become indispensable. The revolution did not bring peace. Libya is now roughly split between two warring administrations: the House of Representatives (HOR), which gained international recognition after elections in 2014, and the older General National Congress (GNC), whose members refused to accept the ballot results then seized the capital with their Libya Dawn militia coalition, forcing the HOR to flee east to Tobruk. The two sides are now fighting over what's left of Libya's oil, money, and power, derailing hopes of post-Qaddafi recovery and seemingly edging toward a state of complete collapse. The UN Security Council is enforcing a unanimously adopted arms embargo on the country while its mediators push for a diplomatic solution. But fighting continues with the weapons at hand, however elderly they are. Related: Libya: A Broken State. Watch here. Misrata is home to Libya Dawn's most powerful militias — comprising around 40,000 members in 200 groups — and its fighters are deployed on numerous fronts, including south of the capital where a force of army remnants and allied militias loyal to the HOR are pressing forward, led by General Khalifa Haftar. The GNC has at least notionally brought Libya Dawn factions under its control and officials like to describe them as an organized military force. But some commanders value the workshop more than any government backing. "This is our backbone, without it we are nothing," said Salem Ismail, 44, the head of a militia group with men deployed at fronts outside Tripoli and elsewhere in the region. Inside the warehouse almost everything is smeared with rust or mud. Sometimes both. Weapons and munitions in various states of repair and function are scattered everywhere. There's dusty artillery, mortar shells of unknown viability, cut-down trucks with makeshift armour, rocket tubes, and Soviet-era light weapons — anything that might be used to keep the Libya Dawn war effort moving. 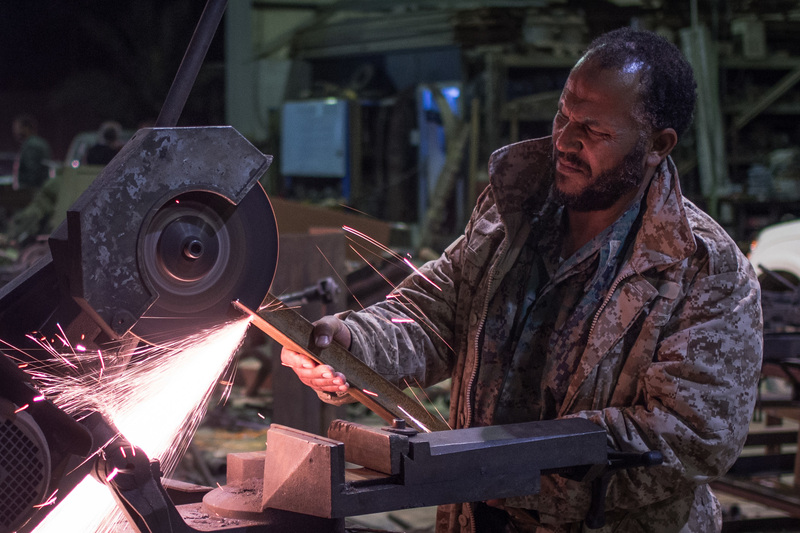 Mounting weapons on civilian pickups to create vehicles known as "technicals" makes up a large chunk of the workshop's operations, its cheerful 52-year old-owner Sadoun Langa told VICE News during a recent visit to the facility. Some guns and launchers are swapped from armoured vehicles too heavy or decrepit to be used in quick operations for this purpose, while others are lifted from static anti-aircraft batteries and other defensive emplacements. Anti-tank weapons are what the militias want the most now however, Langa added, as General Haftar's forces have large supplies of heavy armour. The makeshift factory deals with more exotic weaponry too. In an office turned electronics workshop, various mismatched pieces of hand and vehicle launched guided anti-aircraft missile systems are stacked in among piles of half-dismantled electronic binoculars and rangefinders. The men working there say they're trying to wire up the components in order to have some effective protection against airstrikes. Langa's team is even attempting to arm attack jets. Libya Dawn's "airforce" is limited at best and contains only a handful of operational planes, mostly old and Russian. Among them is at least one Mig-25, a high-speed Soviet-era interceptor purchased in large numbers by Qaddafi. But there were no weapons for it, so they've converted unguided air to surface rockets intended for a different model to fit the airplane. Langa admits that the results are not likely to be particularly accurate, however, laughingly describing them as "primitive". A friendly steel worker clad in unmarked military fatigues, Langa said he turned his welding workshop to weapons-making the day the revolution began. Recounting the story over dates and buttermilk on a dusty sofa, he smiled in disbelief at the idea that he could have done anything else. "The reason was clear!" he said. But Qaddafi's strict rules on arms ownership meant that the rebels had little to work with at first. The only guns available in any quantity were air rifles, so Langa and other volunteers modified them to fire shotgun shells. They were not effective weapons, but lethal at close range, and alongside Molotov cocktails they were all the rebels had to take on security forces during the initial stages of the uprising. It was a frantic time and the untrained revolutionaries banded together to stop Qaddafi's forces pushing into the city to quash the uprising. Ismail, a powerfully-built fisherman with close cropped hair, drove VICE News around a still battle-scarred neighbourhood pointing out where he'd been during the opening stages of the fighting: The unfinished restaurant where he'd used his knowledge of explosives to make a large IED (improvised explosive device), and a bullet-pocked building where he and others holed up opposite government troops. Ismail and most of the men who fought alongside him had no military training and made mistakes to begin with. He recalls dismantling tank shells while smoking, and laughingly describes the time that he and a friend were given a looted PK machine gun. At first they sat on the pavement trying different bullets until they found which fit, then shot it at Qaddafi's troops using the wrong stance so that hot shell casings ejected into their faces. But they learnt under fire and as a result, they learnt fast. "Necessity is the mother of invention," Ismail said. "Death was coming no matter what. If they [government troops] had come into Misrata they would have slaughtered all of us." Langa and his team of volunteers at the workshop learnt fast too, moving quickly from air rifles to far heavier weaponry when private boats began to arrive from Benghazi with weapons seized from the military there. His team began to make technicals and create handheld launchers for aircraft rockets, helping the revolutionaries prevail during heavy urban fighting focused around Misrata's central Tripoli Street. After three months, they managed to drive back Qaddafi's forces. Related: The Rebels of Libya. Watch here. The scars of the fighting are still visible in Misrata, its central areas bullet-pocked and half-collapsed. Today, the battle is commemorated in a museum featuring pictures of those who died along with destroyed weaponry that had been used by government forces, as well as the rebels. There are also items said to have belonged to Qaddafi and the famous statue of a fist crushing a US plane that he had made after American aircraft bombed the country in 1986. The city's battle-hardened militias went on to play a decisive role in fighting elsewhere in the country including Sirte, where they eventually killed Qaddafi. When the revolution was over, they did not disappear, but consolidated power to become the core of Libya Dawn. Langa's workshop continues to play a crucial role. They're more organized now. There's whiteboard at the entrance to the machine shop giving details of how the operation works and asking that each militia brigade appoint a single representative to liaise with it. Anyone who wants work done there must now submit an application form, volunteer Arif Abu Zaid, 52, told VICE News proudly. The team is currently 16 strong, none of them paid. Many are from the still-operational local steel works and say they're doing this for their country and for freedom. One machine worker who had studied in Budapest stressed that even freedom should have limits, however. "We want this, but not like in America, where a man can marry a man," he told VICE News firmly. The voluntary workforce is crucial, Langa says. "The person volunteering won't look for salary or anything in return. All of this is for Libya." It is typical of this city. The workshop is part of a larger community that bands behind the militia fighters. A local women's association makes food packages, sometimes with messages of encouragement inside, that are delivered to men at different fronts and checkpoints. In turn, commanders say they help keep youth in line, mediate in disputes, and give their men time off for education. And Misratan residents seem to consider themselves somewhat separate from the GNC leaders. There is a sense in the city that the revolution is still underway and that the fighters are its guardians. Ismail describes the current fighting as a "correction" of the revolutionary path. Related: Proxy War Feared in Libya as UN Envoy Warns Against Foreign Intervention. Read more here. This feeling is bolstered by the widely-repeated narrative that portrays General Haftar and his men as Qaddafi loyalists (they in turn describe all of their opponents as "terrorists"). For a time many Libya Dawn leaders also claimed that the Islamic State (IS) militant group — which took advantage of the chaos to gain a foothold in Libya — was also part of the old regime. Misratan militias are now fighting IS all the same. But they're overstretched and casualties are mounting, sending a steady stream of bodies back to the city. "Now we have six prayers every day (instead of the usual obligatory five) because of the funerals," Zaid says, adding that it has now become normal for a family to lose three or four members in the fighting. Brigade commanders say they're well stocked with weapons, however, and while there is no doubt that they are, they are all making do with equipment that is in some cases considerably older than they are and operated in tough conditions. And community spirit alone can't keep these militias armed. Zaid notes that the workshop team has even worked on ordnance dating back to the 1930s. He jokes that they're "well aged," but later adds that such weapons have cost lives. Only a certain number of rounds can be launched from a mortar tube, for example, before it becomes as dangerous to the operator as the target. But he and others have no way of telling whether it's reached that point. "Sometimes they explode while being used," he says. "A lot of people have died like that."